Faced with the most serious protests against his 30-year rule, President Omar al-Bashir's declaration of a state of emergency will not save his bankrupt, unpopular regime. Instead, security forces must halt worsening violence, Bashir should step down and all sides should work on a broadly inclusive transitional government. President Omar al-Bashir's address to the nation on the evening of 22 February attempted to defuse the crisis that has engulfed his administration in the longest wave of protests in decades. Instead, the president's words infuriated protesters and steered the confrontation, pitting the regime against a diffuse, still-peaceful protest movement into a new, more dangerous phase. Bashir spoke of the need for dialogue but in declaring a state of emergency, he placed more obstacles in the way of talks. He dissolved the government at the federal and provincial level and, shortly after his speech, appointed security chiefs to head all 18 of the country's regional states. He has in effect allowed the armed forces to run the country for a year. Protesters greeted Bashir's words with derision and anger. The president offered what seemed like a concession in declaring that parliament, which is dominated by the ruling party, would defer proposed amendments to the constitution designed to allow him to run in 2020. But this did not satisfy protesters calling for him and his circle to step down and for the formation of a transitional government. The embattled president has played this card before. In 2013, following large protests by university students unhappy with the state of the economy, Bashir promised not to stand for election in 2015 only to renege. Although intelligence chief Salah Gosh told the media before the president's speech that Bashir would resign as head of the National Congress Party (NCP), which would have ruled him out as a candidate in 2020, Bashir made no such announcement. More importantly, by suspending the constitution and giving the security services the lead role in maintaining order, Bashir deliberately set the stage for a lopsided dialogue which the opposition has already rejected. This too is a card Bashir previously played in 2013 when he used massive repression against protesters and then called for talks with a weakened opposition a year later. This is not Sudan's first state of emergency. Previous rulers faced with mass protests have often turned to this blunt tool. Bashir himself has repeatedly declared an emergency in several provinces since 2011 in a bid to quell uprisings. In practice, this means deploying more troops - with fewer restraints on their behaviour - and erecting multiple roadblocks in an effort to control the civilian population's movements. Under the terms of the decree, security forces can raid premises without warrants and seize property. The order also grants authorities power to ban organisations without explanation. Shortly after Friday's announcement, armed security forces surrounded the offices of physicians who have been at the vanguard of protests, firing tear gas to force them out before detaining several of them, according to activists. Unarmed doctors have been among the most active professionals taking part in weekly protests calling for change. The regime also detained dozens of protest and opposition leaders Friday night and Saturday morning. Credible reports are emerging of isolated clashes between units of the National Intelligence and Security Services (seen as most loyal to Bashir) and army units siding with protesters in Port Sudan and other cities. Despite the increased danger, demonstrators poured into the streets in large numbers in several cities and towns around the country a day after Bashir's speech, braving a police response that included use of live ammunition and tear gas. The risk of an escalation of violence is higher now than it has been at any time since protests broke out in the third week of December. Sudanese police and its various armed forces already operate under notably permissive laws, enjoying immunity from prosecution. Human Rights Watch reports that security forces have killed at least 51 civilians since the latest round of protests began. With the regime's back to the wall, these forces are likely to behave with even greater brutality. Although a new wave of repression against civilians represents the most pronounced danger in the coming weeks and months, it is not the only one. Prolonged unrest has widened pre-existing fissures within Bashir's regime. According to officials with close links to senior members of the ruling party, by dissolving the government Bashir sought to pre-empt a potential coup from within the NCP. Indeed, the regime appears more divided than in the past. The most prominent divide reportedly pits the senior military establishment (whose loyalty Bashir attempted to further cultivate by appointing 16 out of 18 state governors from their ranks) on one side and an Islamist wing whose leaders are said to advocate a more positive response to demonstrators' demands on the other. If the split deepens, it could raise the spectre of a dangerous confrontation between these well-organised and well-armed camps. Protests began in mid-December in Atbara, a mid-size town 350km from the capital Khartoum and the historic home of Sudan's once-powerful trade union movement. The immediate trigger for the public outpouring of dissent was a cut to a government subsidy that tripled the price of bread. 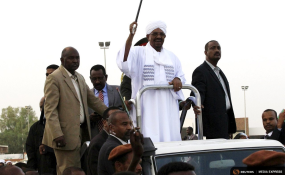 More than in previous rounds of protests, Bashir's opponents have proved unexpectedly resilient. Protesters come from mixed political and economic backgrounds. Professionals, particularly doctors and engineers, have teamed up with opposition parties, many younger ruling party members and the Girifna, a coalition of youthful anti-regime university students formed in 2009. That some of the most intense protests have occurred in Bashir's strongholds, in the wealthier centre of the country, is a potent new development. The regime has veered between repression and promises of reform including supposedly fair elections in 2020, but all this has not been enough to stop the protests. Bashir has a reputation as a survivor but this latest challenge to his rule is especially acute because he has no tool to fix the economic crisis - and no external partner willing to invest the billions that could stabilise the economy. Indeed, the president has reached out to Doha, Riyadh and Abu Dhabi, as well as Cairo and Moscow, but extracted little more than verbal promises of support. Despite having given Bashir substantial funds in the past and wishing that Sudan not collapse into chaos, Gulf partners prefer not to pump substantial money into Khartoum, believing the economic crisis is structural and requires a substantial change in state policies before a recovery can begin. Qatari defence minister Khalid bin Mohammad Al Attiyah arrived in Khartoum shortly before Bashir's speech but authorities did not issue a statement on the content of his discussions with officials. U.S. senior envoy, Cyril Sartor, Special Assistant to the U.S. President and Senior Director for Africa at the National Security Council, travelled to Khartoum in the third week of February to confer with top Bashir administration officials. According to the U.S. embassy there, among subjects discussed were "U.S.-Sudan relations, including concerns about the frequent use of force by the Sudanese government's security forces to quell recent demonstrations". As Crisis Group stated in January, for external actors, the first priority should be to minimise bloodshed on the street. Western partners should warn Bashir and his circle that they will not extend badly needed financial assistance, debt forgiveness, further sanctions relief or normalise relations if the regime keeps up its bloody crackdown against protesters, who have been remarkably peaceful since the uprising began. They should signal to officials close to Bashir that they will be held individually accountable for abuses against civilians. Saudi Arabia, the United Arab Emirates, Qatar and Turkey, all of whom have ties with Khartoum, should likewise counsel Bashir that the course he has taken will do little to resolve Sudan's deep crisis. The U.S. and the EU should make clear that they will not normalise relations with Khartoum if the government gives its forces carte blanche to kill and detain protesters. These partners should maintain incentives for Bashir to step down, including the potential deferral of his case at the International Criminal Court under Article 16, but specify that such an offer is conditional on listening to protesters' demands and enabling a peaceful transition. African leaders who enjoy influence in Khartoum could also encourage Bashir to step aside by offering asylum in a friendly African country. At the same time, international actors should be aware that Bashir's exit alone will not satisfy the demands of protesters who want the fall of the "regime and its head", as they chant on the streets, and that forming a broad-based transitional government would be the only acceptable option if Bashir steps down. Western powers and Khartoum's allies, including African leaders who maintain contacts with various elements of the government, should reach out through backchannels and lean on them to persuade Bashir to lift the state of emergency and refrain from further violence against protesters. Sudan desperately needs substantial financial assistance to stabilise its economy. Bashir has opted to privilege his own survival over the needs of the nation - a move that should deeply concern elites around him. A state of emergency will further limit economic activity, lock out desperately needed foreign investment and send the economy deeper into the doldrums. As far back as 2012, Crisis Group advocated formation of a transitional government for a fixed period including the ruling party, the opposition and civil society to implement defined reforms as one model for a managed transition to end three decades of Bashir's rule. This remains a credible option that would require concessions by all sides. The opposition would need to accept that the NCP must form part of such an arrangement. The NCP in turn would need to accept that it cannot dominate such a coalition. The sustained wave of protests, gradually mounting since December, has highlighted the frustrations of a wide cross-section of Sudanese with Bashir's regime. The scale of the economic crisis leaves Bashir with few tools to respond. He seems ready to deploy violent repression to ensure regime survival. All those with access to him should make it clear that this is a losing bet. Further violence will only compound the crisis and could lead to chaos - with a high cost both for him and for Sudan.